Convergence Instruments (CI) is a global designer and producer of affordable, high-performance solutions for data acquisition and analysis. CI focuses on small-yet-powerful data loggers with embedded acoustic measurement, motion sensors and vibration measurement capabilities for consumers as well as commercial and professional OEM markets. CI’s newest product is their Cloud Data Solution, released in early December 2017. It allows all of CI’s Wi-Fi-enabled dataloggers to report captured data straight to the cloud. CI’s cloud capability offers multiple datalogger benefits for customers. Users can access recorded data from anywhere in the world at any time using a simple web browser. They can also receive email alerts when sound or vibration levels have passed predetermined thresholds and monitor equipment health. Customers can use the cloud to avoid the cost and complexity of having to configure and use their own server. This makes CI’s cloud a great asset for their customers. Cloud Data Solution is for long-term, continuous monitoring of sound and vibration conditions. Customers can use it to monitor sound environment in a city or high-risk locations like airports, railroads, construction sites and more. The Cloud Data Solution can monitor noise around wind farms, sound levels during special events, ground vibration levels and building integrity during construction, blasting, pile-driving, ground compaction and more. Environmental impact studies can also take advantage of this CI service. So how does it work? First, instruments — like sound level meters, vibration meters and dataloggers — continuously monitor the environment around them. Ultra-low-power instruments monitor for weeks to months on an internal lithium polymer battery. When the instruments are outdoors, the internal battery can be recharged by CI’s small-form-factor solar panel, which gives them indefinite autonomy. At regular intervals, or when an event is detected, the instrument connects through Wi-Fi to an access point in its immediate vicinity (within 50 meters). From that access point, the data is transferred to a server at cidatasolutions.com, where the data is pre-processed and stored long-term for the user. At any time, an authorized user can view the data directly, see a corresponding graph or download the data for further processing. Most data can be monitored and stored with CI’s Cloud Data Solution. For example, a sound-level meter can record sound levels and short-term LEQs. That data is transmitted to, and stored on the cloud. 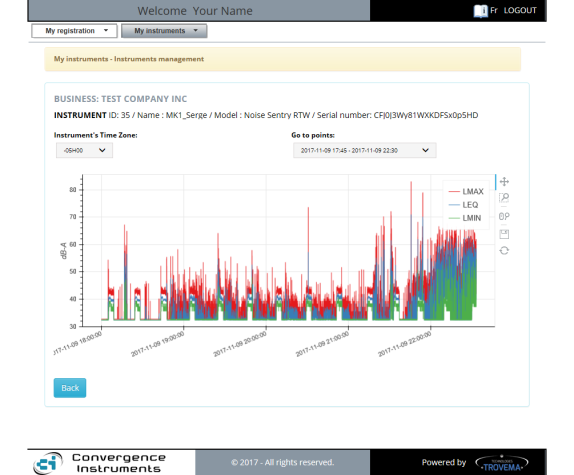 From there the user can quickly visualize levels as a function of time, or download that data to calculate LEQs over longer periods, percentiles, CNEL, LDEN, DLE and other metrics, using software available free of charge from Convergence Instruments. Or a vibration data logger can record acceleration or velocity levels on three axes, acceleration or velocity raw signals on three axes or inclination (two angles). From there, peak-particle velocity (PPV), acceleration and velocity spectra and time-frequency representation can be calculated. The service will send alarm emails when the instantaneous sound or vibration level goes over a predetermined threshold and when the battery is weak. Learn more about the new Cloud Data Solution platform.